Like Eddiebosox, wine service was not up to snuff. I did the wine pairings while my wife picked a couple of glasses. 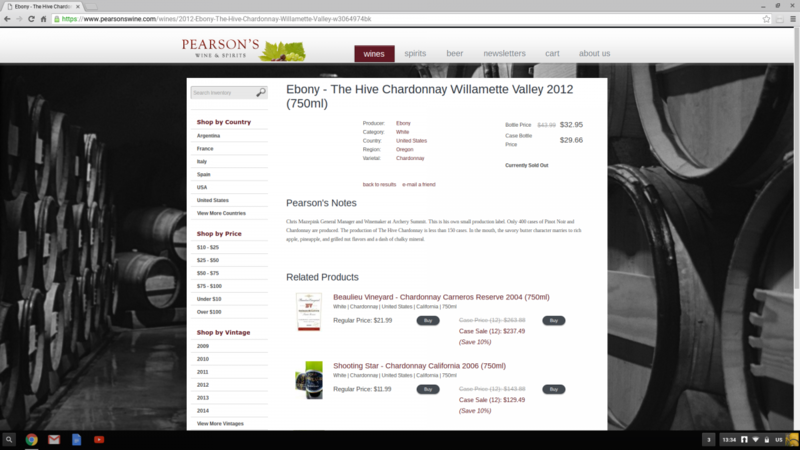 As an initial matter, the wine pairing is $125. If someone else could confirm this, it appears that this is more than a full bottle of all four wines would cost at retail. 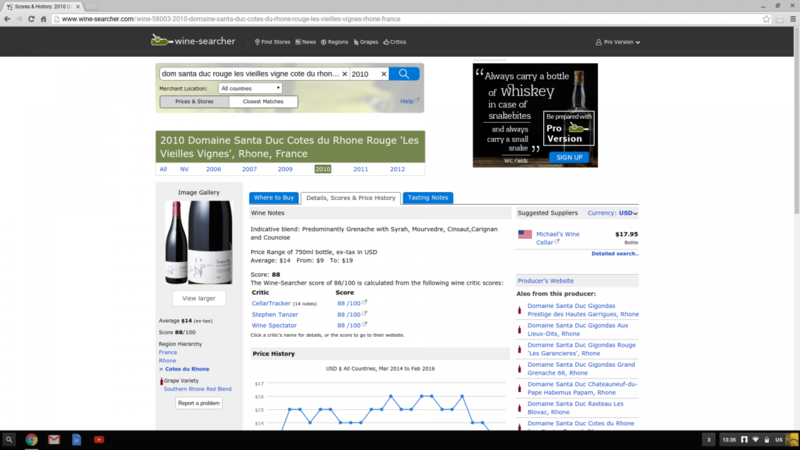 The Santa Duc, for example, appears to retail for under $20. While value, particularly at a fine dining restaurant, is relative, service is not. Twice, we received dishes before receiving our wine. The first time, we actually had to flag down someone to help. The second time our server notice us looking around, but it took three trips to the table before I received my wine. The first trip, he brought the wrong wine, the second trip, he brought the wrong glass. In each case, our food sat in front of us for at least five minutes, before we received our wine. Again, this happened twice. I couldn't find the exact vintages for all wines, but your assumption is correct: the bottle prices for all four wines are under $125 at retail (and they purchase at wholesale, not retail). 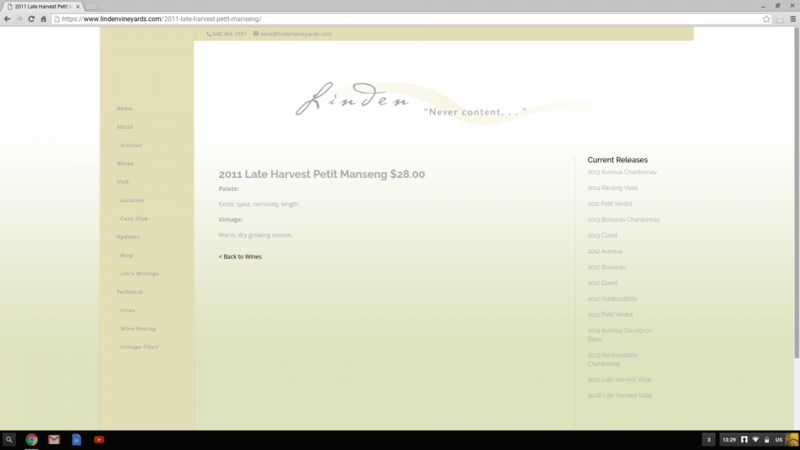 Unfortunately, you paid $31.25 per glass (plus tax and tip, which works out to about $40 per glass) for wines that I wouldn't pay $10 a glass for - these are wines that I wouldn't even give a second glance to in a retail store (a possible exception being the Linden). The wines need to be poured *before* the course is served so you can adjust your palate before taking the first bite, and at these prices, if you finish your glass (especially since you're staying at the Inn, they should keep topping you off until you don't want any more - if you got one glass of each wine, this is simply inexcusable. The Inn, at one time, had a *stupendous* wine list because they bought the entirety of Le Pavilion's wine cellar - it was up for auction, bottle-for-bottle, but the auction was canceled because the Inn cut a deal for the entire cellar. There were some amazing wines in there, too, but this was about twenty years ago. 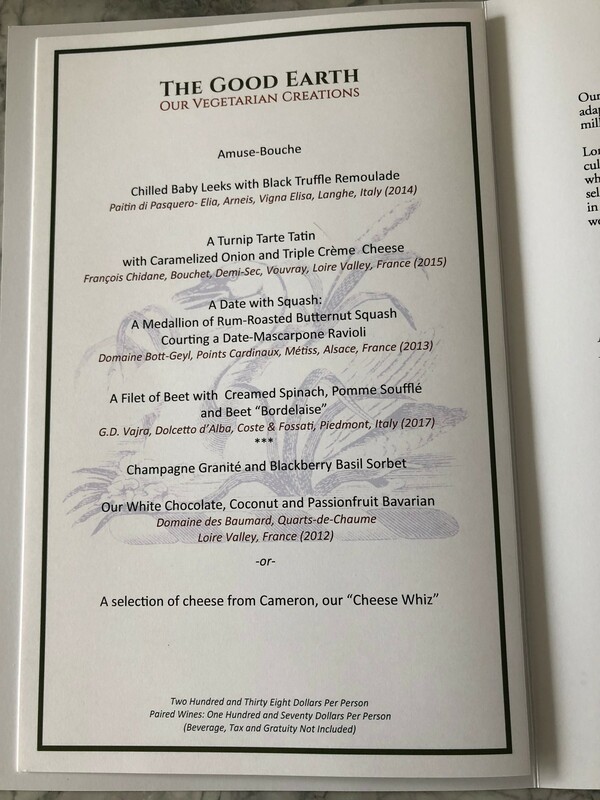 As recently as ten years ago, they still had a tremendous wine list by the bottle (and they may still have), but these pairings are just a rip-off. I'm afraid that in the restaurant world, people believe what they're told to believe, and they're being told by "experts" who don't know what the hell they're doing. I hate to be so cynical, but it's true (I'm not talking about you here; I'm talking about the dread I feel in having to possibly return to a restaurant to review it). I've been in those "waiting for the wine while I stare at my food" pairings too (not here, other places) and it is excruciating and inexcusable. 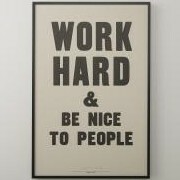 Especially here. Ben Jones, former Georgia Rep and Cooter on Dukes of Hazzard, has a store in Sperryville. I got a signed mug and a picture with the General Lee. This has to be the greatest username/celebrity sighting combo in the history of this site and maybe the entire internet! Nicely done! I was surprised to see the Inn is now on OpenTable. I was even more surprised to see how much availability there was. I'm not sure if it's because it was Easter Weekend or what, but we had dinner at IALW last Friday and experienced similar issues as Eddiebosox that simply aren't acceptable at this price point. You should have said hello! My wife and I were also there Friday night, celebrating my 60th birthday (arrgghhh!). Your review is spot on and matches our experience in several ways (except we stayed in the main building and had no problems with the bill). We've been to the Inn numerous times in the past 30 or so years. For a while it was near dining perfection (I remember a waitress joking as she adjusted a fork she hadn't placed exactly right, "break a rule, break a finger"). It then had a steep decline around the time of the divorce and we stopped going for a while. It had picked up on more recent visits, but still was not performing up to past standards. We thought the food this time was excellent. I had the Menu of the Moment and my wife had the Classics. For me, the seabass was one of those wow moments you want in a restaurant like this. Unlike Cooter and Eddiebosox, my wife thought the lamb had that same wow factor. We had similar questions about the amount of the brioche toast and a couple of other minor things like that (I'm blanking on specifics now), though, that detracted slightly from the meal. 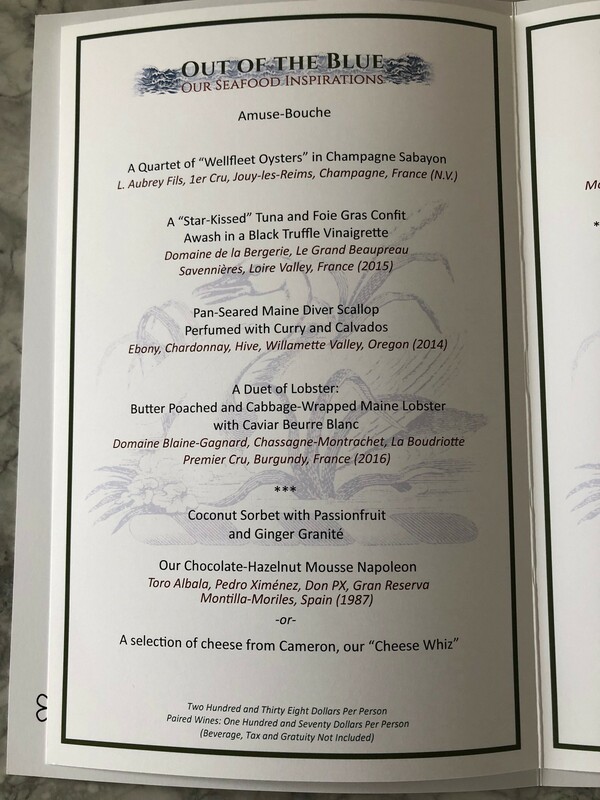 We didn't do the wine pairings - I have never been to a restaurant at which they are a good or even reasonable value - see Lettie Teague's article in the WSJ a week or two back. We brought a bottle from our cellar (a '90 Lafite, if anyone cares) and bought a bottle of Champagne off the list. 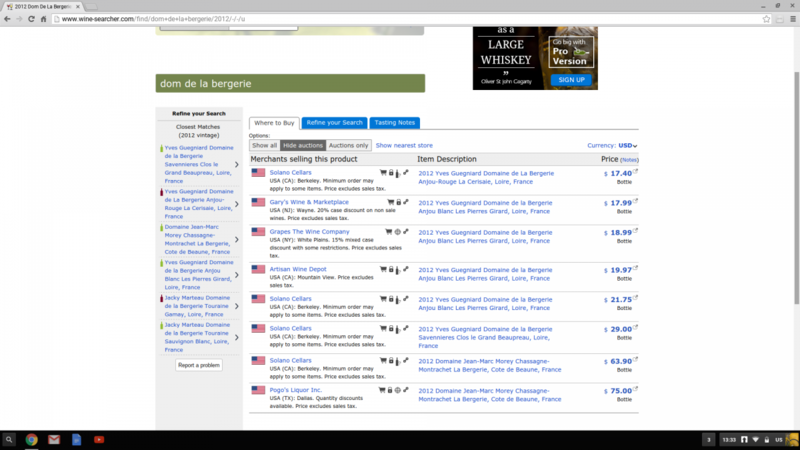 The Champagne was just over 3x retail, but they knock off the $35 corkage if you buy one of theirs. The Champagne took way too long to arrive and it was the wrong bottle when it did. We put off eating the first amuse until we got the wine and had to send back the second until we were ready. Our waiter, kind of clueless in general, offered to slow down the pacing of the meal and didn't understand the issue even though we had mentioned it to the person who brought the second amuse (who must have spoken to him). Once we explained it, pacing was fine, although the meal took so long I was very glad I didn't have to drive home that night. While the glasses were generally kept filled, we had to fill ourselves on a few occasions and they didn't seem to understand why we were switching between the two periodically (pairings were not necessarily best just going white first then red). We also did not get truffled popcorn but that was minor. I honestly didn't look at the menus they gave us, so now I have to go home and check to see if I have the right one. Bottom line, the Inn is still very good but not totally up to the level to which it strives. We go to enough restaurants at that price/status level to have a frame of reference for comparison, and it is definitely better than some (I'm looking at you, Taillevent) but well below others. It's unfair to compare it to Komi (my current favorite), because it's a different type of experience, but CityZen had it beat at the same game. Will we be back? Probably, but it's not a rush. The Santa Duc is a decent daily drinker, but I still can't believe how utterly pedestrian that wine pairing is. Really enjoyed your thoughts. I wrote this on Chowhound thirteen years ago which was our third and last visit to The Inn. 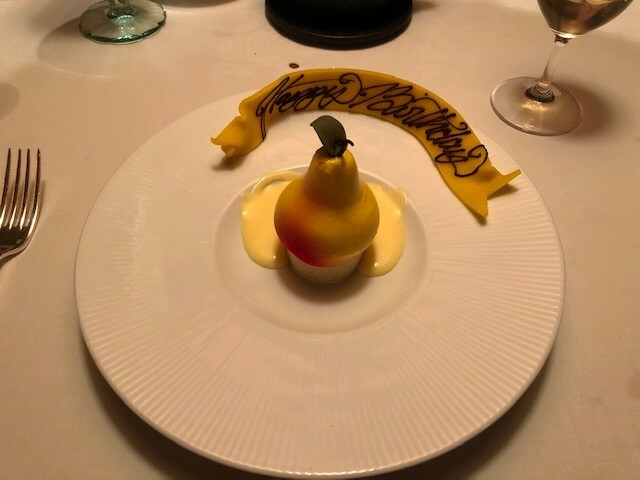 My first visit was in 1980 a couple of weeks apart from Jean Banchet's Le Francais west of Chicago which, at the time, was considered by many to be the best restaurant in America. I am also deeply appreciative to have had a number of significant dinners elsewhere as I and my business matured. 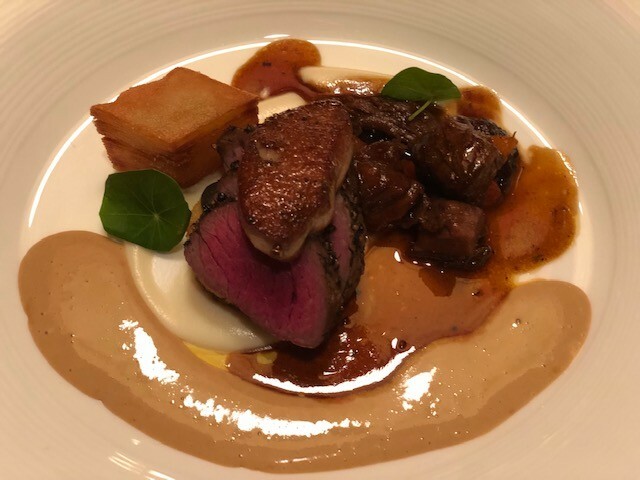 Patrick O'Connell is capable of incredible food: there was a James Beard dinner at the old Maestro at Tyson's which then included every James Beard award winning chef for the Mid Atlantic. (I bought Michel Richard's Chef's Jacket at auction which is signed by all of them.) 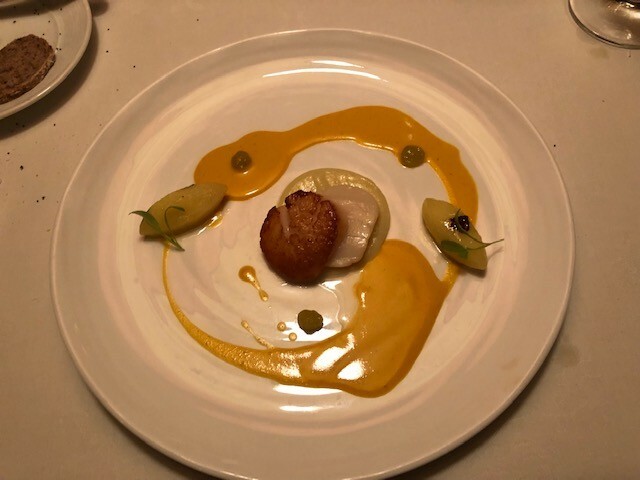 O'Connell had an incredible dish that at the time absolutely starred, eliciting an incredible silence when it was served-everyone in the room was speechless anticipating the first taste. Our earlier experience at The Inn (where I had to literally move my chair a number of times for the "Cow" cheesecart to pass by in the narrow Siberian like hall we were seated in) was a memory that had nothing in common with what he prepared that night at Maestro. I know what he is capable of-I have been truly fortunate to taste some of his best dishes over the last thirty five plus years. However, I unfortunately also remember less than celebratory experiences that marked milestones in our life. FWIW I believe the world benchmark for service is in Baiersbronn, Germany at either of their three stars, Bareiss or the legendary Schwarzwaldstube which define the experience that the Inn strives for. For the latter there is a year's wait for a reservation at one of their eight tables. We have built trips around confirming a table. The trip was a surprise, all he knew was travel by car, dinner jacket no tie, bed & breakfast. We checked into our B&B Gay Street Inn - very nice and got ready for dinner and then walked over to the Inn. The fount entry hall reminded us of the portrait room at the Haunted Mansion, luckily the mirror did not expand on us. We were seated in the back of the sun room, an nice quite table away from the main room. We started with cocktails and then the three rounds of amuse bouche started. and finally a cheese brioche with a tomato orange soup. 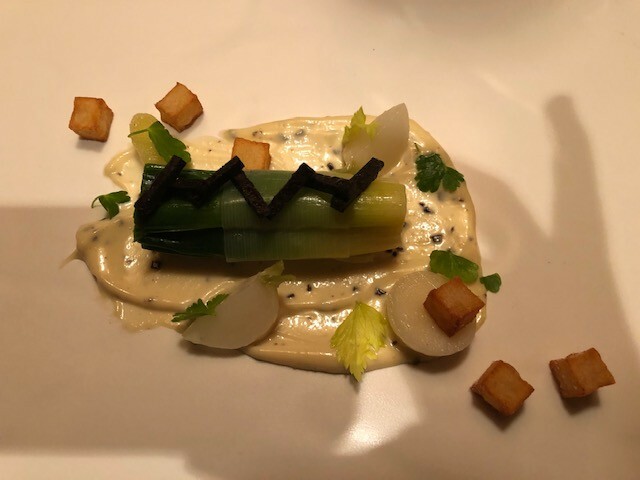 Mine started with the Tin of Sin - Royal osetra caviar with Sweet Crab and Cucumber Rillette (Pooch's was a Foie Gras) I had only had black caviar so this was a treat and the combination was stunning. We had the wine pairing and the L'Arco Valpolicella Ripasso from Veneto italy (2010) is now on my list. Well having just dined at the IaLW, I can absolutely see why people consider it special and noteworthy after all these years. The service just blows away the best service anywhere else in the DC area. 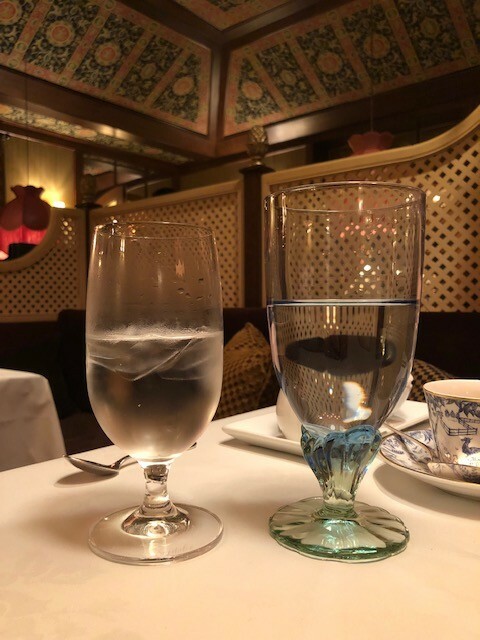 I think it was likely the second best dining experience I have had in the US (the first being the French Laundry), but I thought the service was better than the French Laundry. We went on somewhat of an off night and time, Sunday at 5:00 pm, but this gave us the ability to dine without the restaurant being completely full for most of the night. We had a nice little corner booth in the main room. I loved the somewhat rustic french over the top decoration. The flowers on all the tables were beautiful. Our amuse bouches were crispy cannoli with an onion spread inside, it tasted like the best chip and onion dip you have had. A tiny little baked potato with caviar and chives, a wonderful soup with too many ingredients to name and a gougere. I wish I had paid more attention to the ingredients of the soup, it was delicious. I was quite impressed with the bread service- baking baguettes that small to still have the proper texture is not easy. For a first course I had foie gras with catalan custard- this was executed perfectly and very rich, I don't know upon reflection if I would start with this again. It was good, but it was a bit like starting off with the richest and most decadent dish. It worked well overall, but I had a bite of Hubby's Tin of Sin, and that was just a really good first course of caviar and crab on brioche toasts. I think I just had dish envy. For the next course I had the sweet onion polenta cake, crispy brussels and soft egg from the vegetarian menu. This was absolutely delicious, polenta with soft yolk and a little veg crunch. Hubby had the lobster and rock shrimp with spaghetti squash in sesame-jalapeno. I liked the way the spaghetti squash salad was prepared, it was really nicely dressed and added nice acid to the dish. This round was a tie. Next up, I had the rabbit duo with a mustard and something else crust, chestnut, apple and prune with a beautiful pan sauce and he had a butter poached halibut with artichoke butter sauce and caramelized fennel. We actually switched dishes here. The rabbit was good, but I am not crazy about mustard crusts (funny enough since we were celebrating our anniversary, the first dinner Hubby ever made me was mustard crusted lamb chops and I HATED those). I really liked his fish it was poached perfectly. The caramelized fennel, I will work on making in my dreams it was delicious. Then he had duck breast, pan-seared, duck sausage and duck confit and sauerkraut. He normally doesn't like kraut, but ate this one- good job you IaLW. I thought his dish was really delicious and again just nicely balanced. I loved my dish of lamb loin and somewhat spicy lamb sausage with parsley puree and a crispy little potato thing. This was just beautiful lamb and a very nicely composed plate between sauce and spice, chewy and tender. I think another tie. We then had a palate cleanser- Hubby had a little ice cream of something. I had a coconut sorbet with passionfruit pearls (I love both coconut and passionfruit). For real desserts, Hubby had the apple galette, the crust was croissant like and just perfection. I had the lemon tarte with blackberry frozen yogurt (yay frozen yogurt) with a lot of pistachio. I liked the difference between crunch and smooth and tarte and sweet. I was really impressed by all the baking, not just the cooking. But I always think great chefs are ones that not just nail the main items of the dish and the other little bites, as well. Each little vegetable or fruit had a point and was thought about. Patrick O'Connell came out to talk to us, and Hubby talked to him briefly about his event at Mount Vernon, and he congratulated us on our anniversary too. We also got to talk to him a bit in the kitchen. He was just really warm and inviting and so was all of his staff. The kitchen was just perfection. It is amazing to think how he got his start and how much he has been able to do with it. We got to have a really nice talk with a few staff. I absolutely adore the cow cheese cart that others might find a bit hokey. I just thought the whole dinner was as much an experience as the dinner, in a good way, if you like that sort of thing. 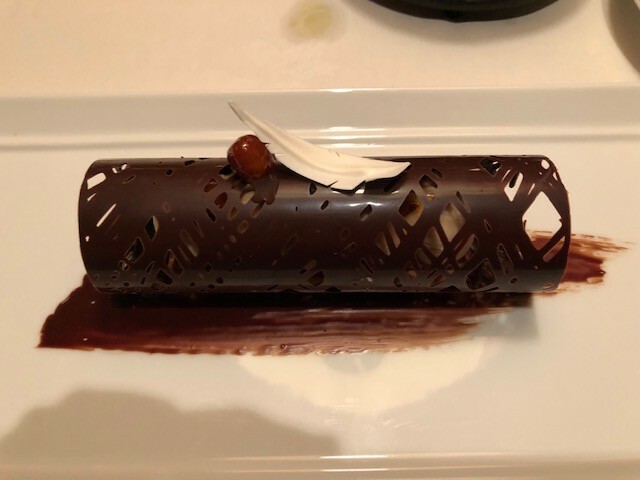 It was a meal for a special occasion- not just because it is, but everyone is dressed nice and most other people are celebrating something and everyone is all smiles, and the staff knows this and just they think of every little detail. I liked the warmth that emanated from the staff, the place just felt loved. Anyway, I am sure other people might find it old fashioned, or what not, but I just thought the whole thing was lovely. We have our little box of goodies. I hope at the Mount Vernon dinner they do the little boxes with the mansion (although I likely can't afford that dinner, I am happy to see it done there and I hope it is just amazing, I will likely see pics and be very jealous). Well having just dined at the IaLW, I can absolutely see why people consider it special and noteworthy after all these years. The service just blows away the best service anywhere else in the DC area. Sorry to quibble with one sentence in what was otherwise a great review -- we've been here only once and certainly enjoyed the service. IMO it didn't blow away the service at Komi, Little Serow, Rose's Luxury, P&P, Tail Up Goat, or Red Hen though. Admittedly, the comparison is a bit apples and oranges for some places on my list. You are absolutely entitled to your opinion! 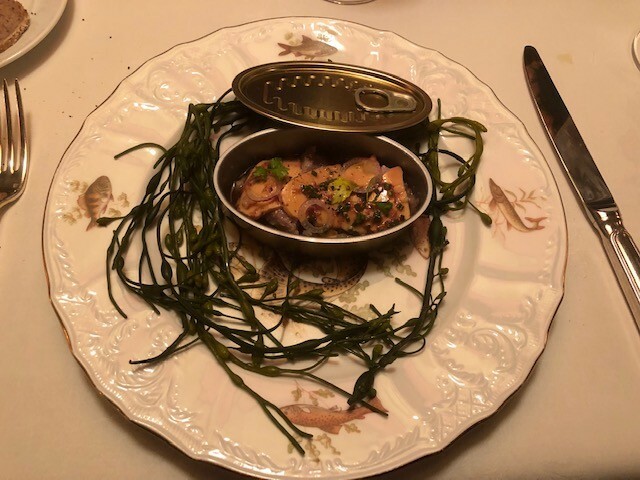 I haven't been to all the places on your list, but we certainly felt much more special and well cared for here than at Komi, Rose's Luxury or Little Serow. Minibar was closer, but still not this good. But again just my opinon, we went on a slow night at not the top time, so we could have gotten a little more attention than on a busy night. The service was just a lot more caring to me, and personal. They knew our names, called us by our proper names all night. We had two primary servers, one who was just really warm and nice. They asked us about our anniversary and where we were from, interests, made small talk, but not too much. Chef came out to wish us Happy Anniversary and speak to us. They were really helpful with menu recommendations, with the wine book, we never wanted for anything to be refilled or replenished. Wine was poured, chilled (at our decision, we could have kept it on the table, we were offered) and served appropriately, not too much, not too little. Water always refilled timely, but at times when it didn't interfere. When I was mopping up egg and sweet onion sauce with baguette they held on taking our plates for a moment, although they cleared other courses much more quickly so we could enjoy the sauce, no snearing at wanting to enjoy the sauce. We weren't rushed at all, they made sure we liked every course, if I commented about an item they would sometimes have something interesting to say about it. But talking with us never felt inappropriate or forced, our server was just really nice. They didn't interrupt us when we were talking. Things were done so well that they never interfered with our meal, they timed dinner perfectly, so when we were taking our time between our first two amuses, they slowed things down a bit for us without us having to ask (but the one other table who was seated right after us was on a faster pace, but they were eating faster). 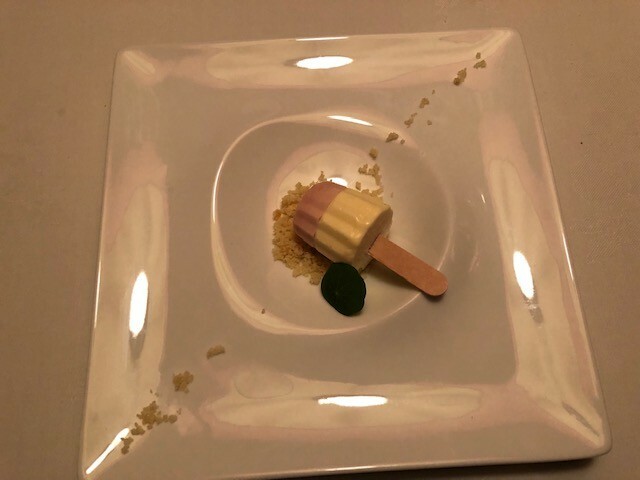 Down to the phrases they used, "this spoon might be helpful to eat the foie gras" and "do you want to enjoy your popcorn all through the meal?" When we went to the kitchen they nicely made sure we knew we could leave anything and they would have it for us when we came out, so we didn't have to take our box of desserts, nor my jacket. We got to talk with Chef in the kitchen for a bit. They offered to take some pictures for us for our anniversary not just in the kitchen, but the front staff and the bellman, when I went to take pictures of things. The manager talked to us about design and expansions, and the cow cart which I wanted to know the story behind. Not a demand or an order or a we know more than you, always open to what you preferred, even in the phrases. Every service member I passed (housekeeping in the bathroom, bar staff) had a smile and was helpful if need be. Just very well thought out from start to finish. And all the things they did never felt like they were doing them as a routine or what was expected, but because they genuinely cared. It just felt different to me. I haven't had those experiences at any place in DC, but again I haven't been to all the places you have been to, I hope to do so though! From Washingtonian: A Labor Day Festival at Inn at Little Washington featuring their friends and numerous sous chefs who had worked there in the past. That looks cooler than cool. I'm jealous. Would have loved to have been there. It was very fun. We are in the background of one of the Washingtonian pics. First three Michelin Stars in the Washington area. Here is a little tidbit, more relevant to our bartending school in Arlington, then my recent dining experiences. The Inn at Little Washington now has two grads of our bar school bartending; one for the last 1/2 year or so and one new. In one sense I'm surprised; the longer term bartender travels a very long distance to get there on her shifts. She loves it. Her wine and fine dining experience prior to her taking our course is ideal for the restaurant. She also has the vitality and smarts to provide the appropriate level of customer service. The second grad is less experienced but has the appropriate attitude and personality to combine her drinks knowledge with their demands and level of in house training. Good luck to the newest hire. I'm proud of them. I enjoy dining or more appropriately dining and drinking at the bars where grads work. Can't hit all of them. Hmmm. The Inn at Little Washington. Oi. I haven't dined there in years. I never enjoyed overindulging in the finest restaurants for obvious cost reasons, but more seriously in that it was "too much" for me. I've done it in little periods and after a while it turns me off. I used to dine there during its earliest years of operation. What a drive. Dinners were spectacular. More importantly we always went there with the same couple, possibly the couple with whom I most enjoyed fine dining. It was always a special occasion and a lot of fun. We always did an early seating so we could head back to "civilization". We always had a sober driver so I could indulge. Meals were spectacular. The other place we went to more frequently was L'auberge Chez Francois; also great, but the dining at Inn at Little Washington was even then at a level that was far superior. So if you are at the Inn...order a cocktail. I'd be interested to hear how it went. I loved the Inn back when it had a big prix fixe menu for around $120, and I still really liked it when the $160 tasting menu was the only option. I don't know how I'd feel about it now that it's up to $238. My wife surprised me with a trip to the Inn for dinner. Until we left, I wasn't completely sure where we were going. She rightfully decided to find a more affordable place to stay, since $800 a night is extremely expensive. We ended up at 1812 Caledonia Farms B&B, which is another story entirely. At $140/night, it was quite a savings. Overall, the every dish we ordered was creative, perfectly prepared, and quite delicious. That said, I have have enjoyed food that's equally as good (or better), and the entirety of the service did not rate 3 Michelin stars. We arrived a bit early, and thought we might have a cocktail at the bar. Since I didn't have time to do any research, I didn't realize the bar is essentially a small waiting area. Nonetheless, we were escorted to our table, which was past the main dining room. I think the area overlooked the court yard--a fire pit was visible outside. Unfortunately, we were seated at a very odd corner table. I say "odd" because there was simply no way for one of the diners to sit directly in front of their place settings. My wife and I looked at one another, and quickly asked to be moved to another table. They moved us to the main dining room to a more conventional two-top. I chose the "Out of the Blue" seafood menu, while my wife opted for "The Good Earth" vegetarian selection, substituting a couple of vegetarian dishes for selections from the other menus. Each menu is $238. As anyone who has been to the Inn knows, the wine list is massive. My wife opted for a single glass, since she was driving, and I opted for the $175 wine pairing. We asked our server for a wine that might carry through my wife's meal, and she decided on a Grenache, which was around $30 per glass. The next "misstep" occurred when the sommelier appeared with my first glass (L. Aubrey Fils, 1er Cru, Jouy-les-Reims, Champagne, France (N.V.) She very briefly described the champagne, but I thought it was very perfunctory. Our cocktail glasses were still half full, so I'm not sure why they decided to begin the dinner service. We both enjoyed a couple of small amuse-bouche, which were quite delicious. Following those, we were presented with a gruyere gougeres and a shot glass of a wonderful cheese soup, enhanced with country ham. Amazing. When our waiter returned, I mentioned that we were in no hurry, and we would like a more leisurely pace. To his credit, the pace of the meal slowed down. Overall, each of the paired wines was a great match for my food, and even though my glasses were never topped off, I thought the relative value was reasonable. That said, the sommelier was going through the motions, only appearing briefly to pour the wines, but never asking what I thought, etc. I'm barely a wine novice, but I've had many more enjoyable interactions with sommeliers at other restaurants. While our server was a bit of a dud, there were plenty of staff members who were funny and engaging. The lack of consistency was a bit puzzling. Based upon our experience, I've enjoyed more value for the money at other places. Two cocktails, a wine pairing, a glass of wine, and two dinners cost $798 before gratuity. (OBTW, two small containers of the truffled popcorn were $12. Each. 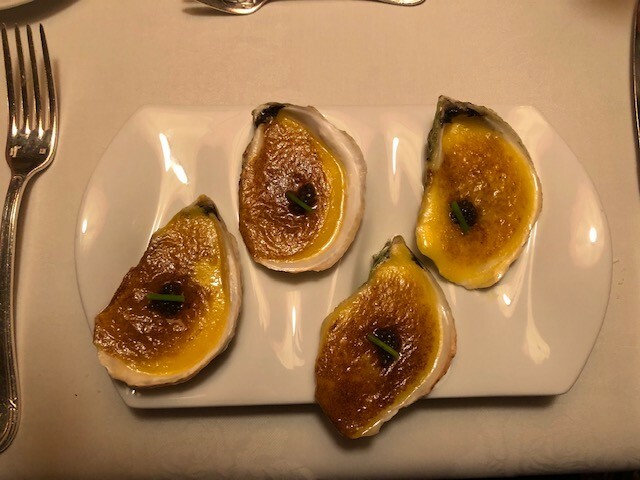 A Quartet of "Wellfleet Oysters" in Champagne SabayonSpectacular. Very rich and decadent. Paired with the champagne mentioned above. Chilled Baby Leeks with Black Truffle Remoulade. My wife's favorite dish. A Turnip Tarte Tatin with Caramelized Onion and Triple Creme Cheese. (Vegetarian). Another highlight. We were informed this was on the menu for the first time. They asked for feedback, and it was all positive. Well balanced textures and flavors, with a perfect warm temperature. Pan-Seared Maine Diver Scallop Perfumed with Curry and Calvados. Paired with Ebony, Chardonnay, Hive, Willamette Valley, Oregon (2014). This was a delightful dish as well. This is the first time I've seen a scallop served sliced. I'd be interested to know why they chose this method. A Marriage of Virginia Bison: *Pepper-Crusted Tenderloin and Braised Short Rib with Seared Foie Gras and Black Truffle Reduction. My wife picked this from the gastronaut menu. I was amazed at the tenderness of the bison, because it was literally "melt in your mouth" texturally. For whatever reason, I enjoyed this dish more than my wife did. Simply outstanding. 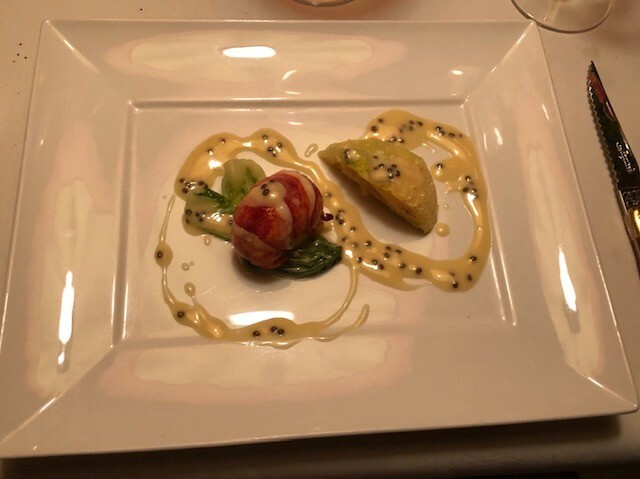 A Duet of Lobster: Butter Poacched and Cabbage-Wrapped Maine Lobster with Caviar Beurre Blanc. Paired with Domain Blaine-Gagnard, Chassagne-Montrachet, La Boudriotte Premier Cru, Burgundy, France (2016). Another delicious dish. I was very impressed by the relatively plain looking cabbage wrapped lobster. The lobster filling may have been a type of lobster mousse. Delicate and delicious. A Lilliputian Pomegranate and Maple Dreamsicle. We both received this. In hindsight, I should have received the listed Coconut Sorbet with Passionfruit and Ginger Granite. Very tasty nonetheless. Apparently a Pear. Paired with Jorge Ordonez, Victoria #2, Moscatel, Malaga, Spain (2015) This dessert's reputation is well-deserved. Chocolate-Hazlenut Mousse Napoleon. Light, but decadent. I chose the "Out of the Blue" seafood menu, while my wife opted for "The Good Earth" vegetarian selection, substituting a couple of vegetarian dishes for selections from the other menus. Each menu is $238. Reedm : thank you for the super detailed post! One question about the above - how many different menus did they have available? On their website they show the "classics", gastronauts, and good earth menus but this is the first I've heard of the seafood menu. *I'm headed here in two weeks and trying to get a lay of the menu situation since the online ones aren't updated regularly. My pleasure. Three menus were available the night of our visit. I assume you can always mix and match as you like. Glad to answer additional questions. Cheers!
. (OBTW, two small containers of the truffled popcorn were $12. Each. That's strange....the truffled popcorn has been included in the tasting menus for as long as I can remember. Wonder if charging for it is a new thing, or if someone screwed up. The one time I had it, it was covered with summer truffles which are notoriously underwhelming. Better Summer Truffles, than Some Are Truffles, I always say. We made a trip to the Inn last weekend, as two friends were visiting from out of town and had never been. Due to a last-minute babysitter snafu we were three rather than four, but the staff handled the situation with aplomb and quickly re-set our table prior to us sitting down. One member of our table had the "Good Earth" menu and the rest of us did the "Gastronaut" menu, with some substitutions. The menu was largely, if not exactly, the same as ReedM noted above. I subbed in the scallop with calvados dish, and one of my dining companions subbed in the lobster dish. 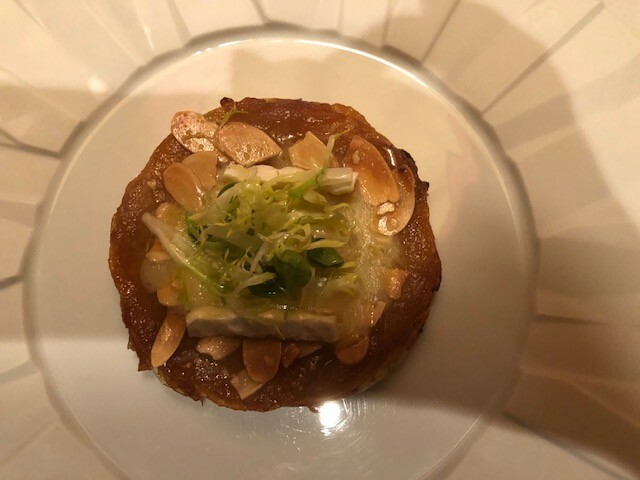 We didn't take pictures (obviously), but the highlight from the Good Earth menu was the Turnip Tarte Tatin/ Highlights from the two Gastronaut menus were the Bison dish (again, identical to ReedM's) and the lobster. The chocolate hazelnut napoleon fell a bit short for me as there was some unannounced white chocolate in there. Should have gotten the cheese cart. 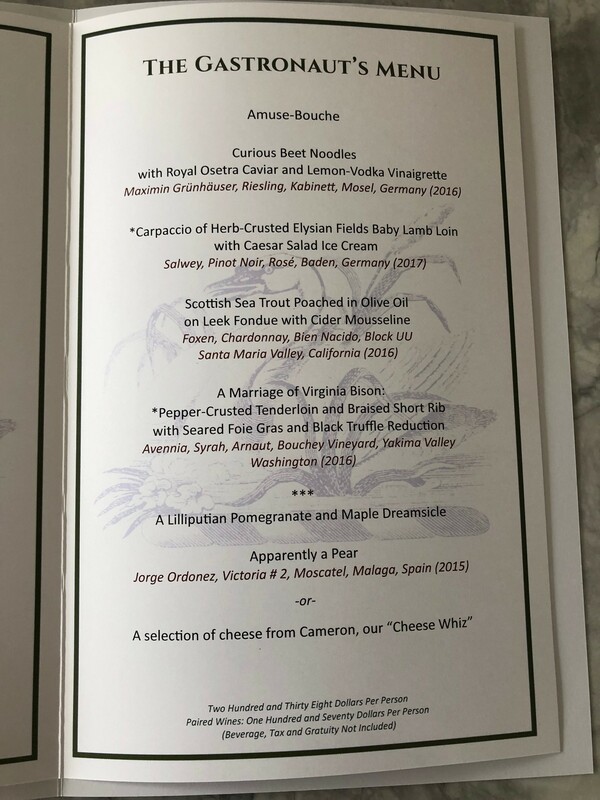 Everyone enjoyed their meal, and this kind of tasting menu (unabashed fine dining, traditional coursing, etc) is becoming harder and harder to find. In that way, the Inn is a bit of an anachronism, albeit in the best possible way. Wine service was slow and uneven. We waited for several minutes once we sat for a consultation with the somm, and she was fairly concise in her discussion. Once the wine was ordered our glasses were promptly refilled. Service was uneven as a whole. Certainly not European *** standard, though that wasn't our expectation. Rather, we had a similar experience as ReedM - some of our servers were engaging and enlivened the mood (particularly the excellent dining room manager) and others were just kind of there. The person manning the cheese cart was previously a highlight with his udderly terrible jokes, but he spoke so quickly and softly that it was basically impossible to understand what cheeses he provided for our group. It's hard to pinpoint a major issue, or something glaringly incorrect about the service, it just didn't resonate as in years/ months past. Also re: popcorn - I wasn't served it in 2018 across a few visits, or last weekend. Perhaps it's being phased out? All in all, our friends enjoyed the experience, which was the main point. We will return in a couple months, but hope that the service is a bit more consistent and engaging. The popcorn was not offered to us. I believe it to be available only on request. Nice report! Your experience seems very similar to ours.